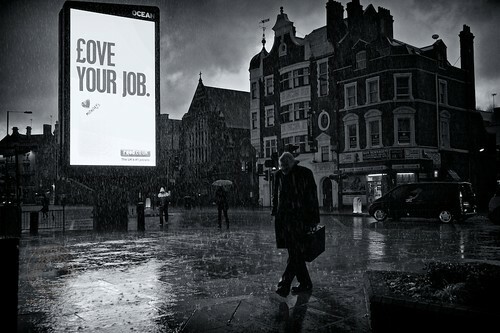 Some great news; my image of a rain soaked businessman during a heavy downpour of rain with a sign displaying “Love Your Job” has been judged as the runner-up in the G-Tech Driven Creativity Competition 2011. Congratulations to all the winners and runner-ups. 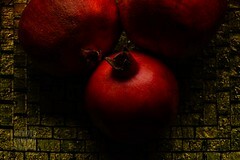 A big thanks to G-Tech for sponsoring the competition and also everyone who voted for the image. 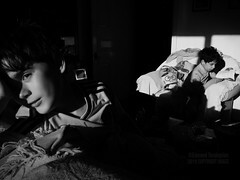 The image was shot on a Leica M9 using a Leica 35mm Summicron ASPH lens. The shot was the processed in Aperture and Nik Software’s Silver Efex Pro 2. 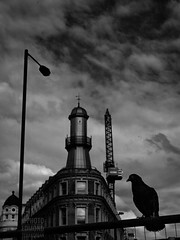 This entry was posted in News, Photography, Pictures and tagged competition, driven creativity, exhibition, g-tech. Bookmark the permalink. Many thanks 🙂 My M9 did get pretty wet although I did try and shield it as much as possible, yet worked perfectly. It isn’t however a fully weather sealed camera so I certainly would expect it to work like a Canon 1D MkIV is bad weather.